The physical and mental aftereffects of what appears to have been maltreatment, give an idea of what happened. There are many scars on her body, some as long as 3 cm. About 30 linear scars are to be found in the region of the Median-line of the neck, the back of the head, the thorax lumber spinal regions, very pronounced on the upper arms and, less obvious, on the right thigh. Some of the scars are faded and deep, others slightly hypertrophied. The scars are most likely from cuts. Apart from the scars, there are also signs of old injuries to the right shoulder, the right collarbone and the back of the head which also stern from the same time and suggest that she might have fallen. She also experienced hallucinations, sleep walking and a sudden feeling of faintness. After the birth of her own child, she had strange experiences. For exarnple, she would get up during the night without realizing it, look for her child at the foot of her bed and panic because she could not find it. Her husband spoke to her and showed her that the child lay quietly sleeping in its own bed. Or she got up, went to the open window, imagined the child in her arms; it slipped out of her hands and fell out of the window - they lived on the third floor - she waited for the impact and screamed terribly until she was spoken to. Even today, she still has strange experiences at night. She sits up and stares about her, distraught. Or she jumps out of bed, runs to the window and screams. When she is spoken to she becomes conscious of what is happening, but usually she cannot remember anything. All injuries, physical and mental, result from the period spent in the orphanage (July 1938-March 1939) when she was a year old and suggest a fall through a window (the scars on the arms are lengthways, the large, deep scars on the back, however, run in all directions ). The serious fall must been seen in the light of the fact that the child of a woman accused of "Rassenschande" was considered inferior and unworthy of life. Did the fall through the window occur during the November pogroms? ("Reichskristallnacht" 9th-11th November 1938). Until May 1940, the Youth Welfare Office in Harnburg had guardianship of both children. However, no files remain from this time. Even in the Guardianship File of the Amtsgericht, pages 6-13 are missing. An obligatory insurance for home children did not exist at that time. The Averhoffstraße orphanage also burned down during the war, so there are no written records available and it is impossible to find out exactly what happened. 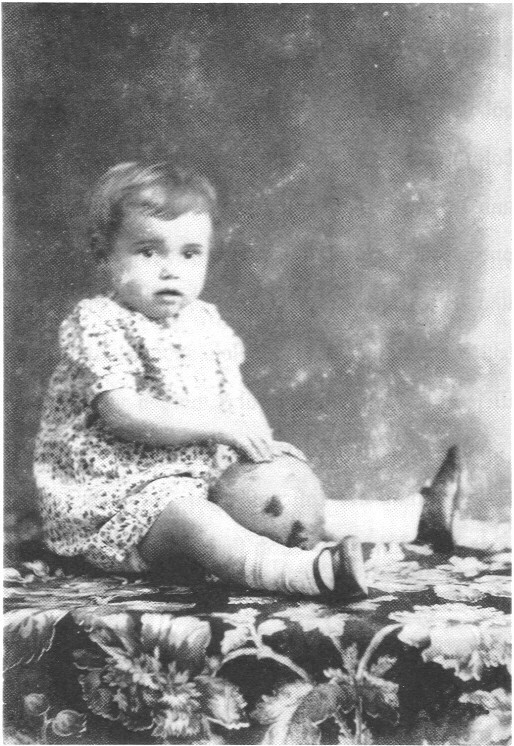 On 31st March 1939 an identity card with the letter "J" (Jude; Jew) was issued for the child. 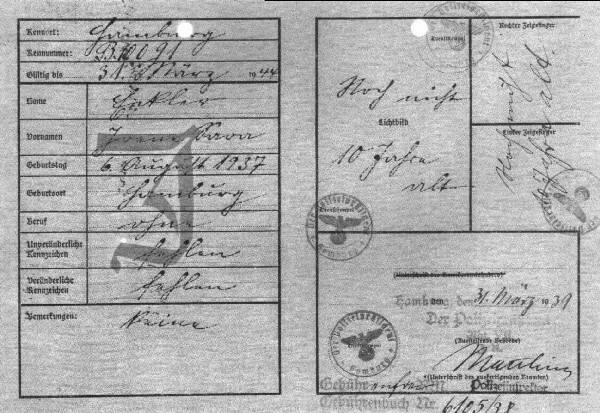 Together with a photograph, this ID card indicates the rnove frorn orphanage to a foster home. Why was the child fostered out privately? Was it easier to conceal the consequences of the fall, this way? The grandrnother knew nothing about what had happened. And Irene's sister, Ingrid, saw the scars in 1994 for the first time. The grandmother could finally visit her grandchild at the home of the foster parents, the Krauses. Ingrid overheard a conversation where her grandmother said she thought the child was not happy there. She maintained that every time she came to visit Irene, her granddaughter, frightened, crawled under the bed. But this proved to be wrong. Irene learnt to trust again. Her behaviour changed and she later developed into a happy, active child. The foster rnother and her 13-year-old daughter knew how to give her a feeling of security. She knew, without anyone having told her, that indeed there was no chair for her because she did not really belong there.